Microsoft's operating system Windows 10 ships with game DVR capabilities that some Windows users can make use of to record in-game videos. Some users? The company made the decision to restrict the feature based on the installed hardware. More precisely, based on the installed video card. According to Microsoft, game DVR capabilities are only available if the following video cards are installed in the machine. AMD Radeon HD 7000 series, HD 7000M series, HD 8000 series, HD 8000M series, R9 or R9 series. If another video card is installed Game DVR capabilities are not available. While Game DVR information may still be displayed on launch of games on the system, actual game recording is blocked when the game bar is opened. You may however capture screenshots using the application. You may still use the game bar to create screenshots of games but the recording of games is not available. There is another limitation that may prevent you from using the feature even if your PC meets the requirements. You may not see the Game Bar while playing games. This happens sometimes when you run games in full screen. Even if you use Windows-G to display it, it won't show up because the fullscreen window overshadows it. The only fix for this right now is to run the game in windowed mode instead. Once you do that, you will notice that the bar is displayed so that you can use its functionality. If your PC meets the requirements to record games, you may want to configure it properly before you start doing so. The capabilities are provided by the Xbox application. Tap on the Windows-key, type Xbox and launch the Xbox application. It is installed by default on Windows 10 systems and should be listed in the results as a consequence. Select the menu icon (three horizontal lines) at the top and then Settings. Switch to Game DVR when the settings open. One interesting feature that Game DVR offers is background recording. This records the game continuously and allows you to start the recording 30 seconds earlier. Handy if you just experienced something that you want recorded but forgot to start the recording. This will affect game performance due to the fact that games are recorded continuously on the system. These settings allow you to change various recording related settings, for instance in regards to quality. Change the maximum recording time. 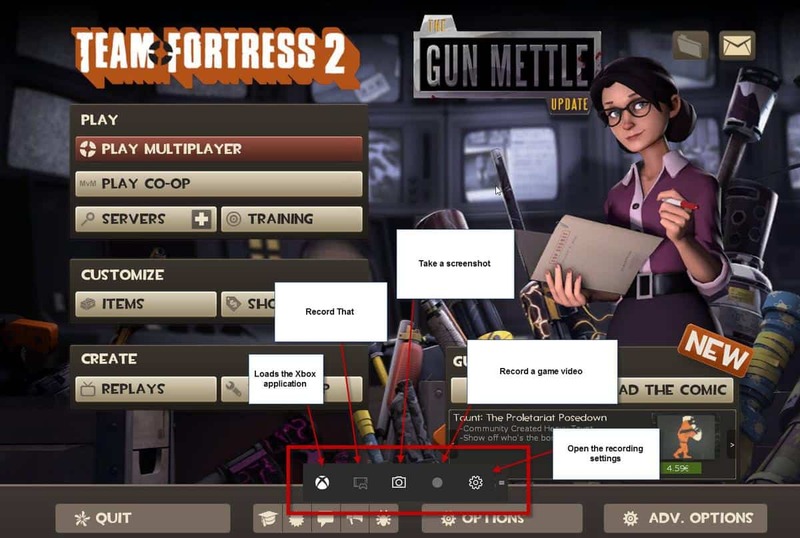 Select the folder you want the game videos to the saved to. The default location is set to the account's Videos\Captures folder on the drive Windows is installed on. Select the desired video quality and resolution, and audio quality. You may use alternatives such as MSI Afterburner instead to record game videos if your machine is not compatible with Game DVR on Windows 10. 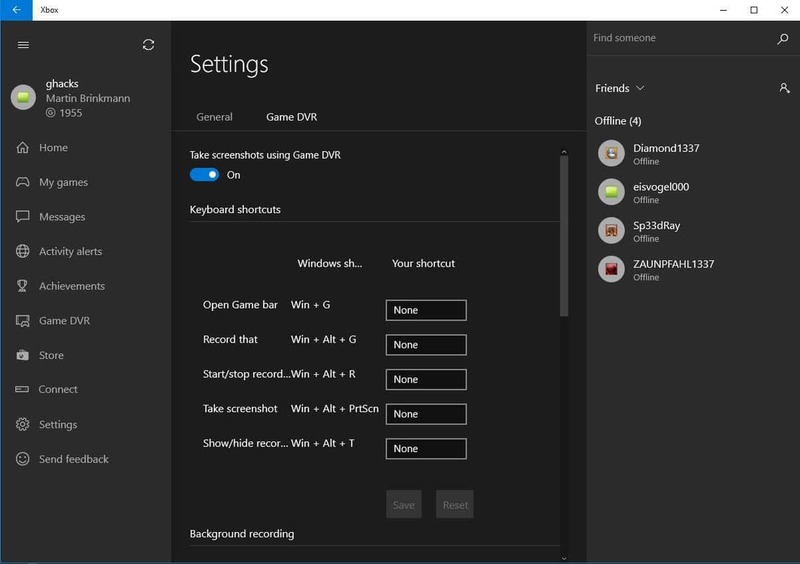 All you need to know about Windows 10's Game DVR feature (requirements, tips, settings) that allows you to record computer games. I suspect that one has to be online to use this feature, in a similar way to AMD Raptr and Nvidia Shadowplay. I just tried it with Tomb Raider (2013) on a Radeon 7950 in windowed mode and I’m told there’s nothing to record, even though the game bar comes up with Win+G. I’ll carry on testing as it may be buggy. Geeze, another win for the NSA. What if game DVR isn’t used just for games, but to snoop in on people’s computer usage? (I don’t think you need a fancy graphics accelerator to capture desktop screens, only the capability to do it, such as the DVR app). Yeah because you are that important that the nsa will want to track you. I’ll be sticking to Action!, Fraps or Bandicam as I ditched Raptr and Shadowplay for the same reasons I probably won’t use Game DVR, ie they tend to be social network sharing recorders. Each to his own. Anyone know why it says my Computer isn’t Compatible even though I have a gtx650? Hi. Please read I have some interesting input. I am no expert, but I have played a lot with the dvr, because have an xbox. I do not play pc games, only have intel hd laptop, but I stream my xbox and record that at top settings with no issues, so the list of video cards is totally wrong. If you switch apps, it continues recording original app only. If you change app size (window size, restore down etc) the capture will place a smaller picture within a black 1080p picture (and not change resolution, or enlarge recorded picture). Can not record the desktop, an app must be “on top” so to speak, and that will be recorded. If someone could create tutorial to alter features, and change it’s rules so it could just capture entire desktop, it would not be too bad at all for a built in noob solution. For desktop recording, nothing beats Snagit. It’s fantastic. Thanks. But $ 59.94 is just silly for me, for a program that just uses hardware I already have. I would not use it often enough to even pay a tenner.